PROPERTY DESCRIPTION: Visit Like A LOCAL...Order Wiener Schnitzel at Pepi’s Restaurant...Add a stein of beer and consider yourself a LOCAL...Then walk across the cobblestone street to your Swiss Ski Chalet. This 5 STAR condo reproduces, within its walls, the inviting European atmosphere of Vail Village. I am not exaggerating when it comes to the location: you will be be hard-pressed to find a rental that is closer to Gondola One and the aprés-ski shopping, bars and restaurants of Vail Village. All are located a minute away or less on foot. EUROPEAN DESIGN: I visited many European ski chalets to get inspiration for the rental's interior. You'll see evidence of my "research" in the artisan details at the chalet, like hand-painted, European-styled doors and kitchen cabinets, vaulted ceilings, and hand-scraped hardwood floors. Warm your toes in front of the gas fireplace, watch classic films on the wall-mounted SmartTVs, or browse and stream on your own devices thanks to our fast, secure wireless internet. FAMILY-FRIENDLY: This rental is brimming with character and craftsman details. But it's also a place where you can relax and get comfortable. Pets and kids are welcome, and families will be well taken care of, with a fully-equipped kitchen and open-concept layout for hanging out together. I'm a grandfather and avid skier, and I love nothing more than spending time in Vail with my family. Some days, the pace just slows down. Thoughts and worries fade and all that matters is what’s around you. The family…The friends...The snowflakes...The next enjoyable run. It’s surprising how clear life gets with a little snow in your eyes! BED & BATH: The chalet has two bedrooms and two baths and sleeps 7. The first bedroom has a queen bed. A spiral staircase leads to the lofted second bedroom, which overlooks the living area and has two queen-over-queen bunk beds. 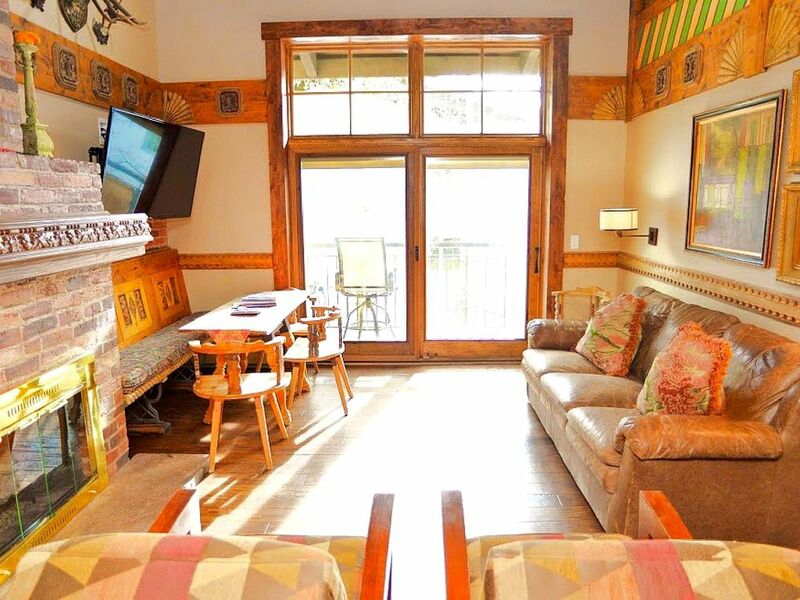 Two full bathrooms mean you can defrost after the slopes without waiting in line. IDEAL LOCATION IN VAIL VILLAGE: Experience a snow-dusted, postcard-perfect setting at the chalet. Discover the thrill of skiing or snowboarding, or take a more low-key pleasure in shopping in the heart of Vail Village. You are surrounded by Vail's finest shops, restaurants, and nightlife. No car needed! Come and enjoy one of the best condominiums in the best location that Vail has to offer. l (Gene) responds to e-mails and phone inquiries immediately! - A Killer Address...Exactly where you want to be in Vail Village. -This 5 STAR condo reproduces, within its walls, the inviting European atmosphere of Vail Village. -View our 5 Star guest reviews. I’ m a Grandfather and avid skier...Some days, the pace just slows down...Thoughts and worries fade and all that matters is what’s around you...The family...The friends...The snowflakes...The next enjoyable ski run...It’s surprising how clear life gets with a little snow in your eyes. The Wallstreet Building is located right off the mountain, just steps from the Vail Village Gondola. This location offers guests all types of fun, day and night. Everything you could ever want in a vacation is right here: Worldclass sking, Award-winning cuisine and the hottest après ski bars. The Unique Benefits this Vail location Offers: Ideal climate for each season. Excellent snow conditions during the ski season. Off season offers many options for leisure, such as hiking, golfing, fishing, biking, fine dining, shopping, pub hopping, horseback riding, river rafting. The beauty of seasonal changes, and a great place for family and friends to gather. Vail Village. On the culinary front, world-class offerings abound. From five courses to five-minute bites, Vail has a bounty of options and flavors. World-renowned chefs. The best burger in town. The best fine dining on the mountain. The freshest sushi this side of Vail pass. Whatever your taste, or your budget, Vail has a perfect dining option. Explore Vail Village: Cozy, without cars, the awesome mountain village is yours to explore. Walk leisurely down the cobble-stone streets, the town of Vail runs the gamut from elegant shopping to quick café latte’s, fine dining, and everything in-between. I have been coming annually to Vail for 54 years and so know to Village quite well. My dog loving grown daughters were tasked with finding a well located, dog friendly abode for a 2 week respite for themselves, 2 small dogs, my wife and I. This condo definitely fit the bill. This condo has alpine ambiance in the middle of Vail Village, just a short walk from the Gondola. There is ample room in the loft with 4 queen beds (2 bunks) and a twin to sleep a small horde of guests/children. The loft beds are built in bunks and are creatively done with the same creativity and thought that permeates the entire unit. The full kitchen is well supplied and the adjoining living room/dining space is ample for 6 living in, and accommodated several apres ski events, one including 12 individuals. While there are 2 full baths, privacy can be an issue as there is only 1 bed room and a loft. The extensive loft living space is not actually visible from the ground floor, however. Despite the condos "downtown" location it is actually quiet owing to its 3 floor location and fronting on a quiet walkway. Gene, the owner was readily available for any problems and issues a daily comprehensive ski/weather report. He even took my daughter on a 7:30am "first tracks" club for powder skiing. (Experts Only!). Small drawbacks- no elevator and no on sight "ski storage." Cozy and quaint condo. Nice living area with comfy leather couch and fireplace. Very convenient location! Close to Gondola One, shops, restaurants. Loved it! More than I hoped for! I rented unit 301 and 303 from January 5 to January 12, 2019 for a bunch of family members and myself. The location is perfect. You can walk to everything. We did not have a car, nor did we ever need one. Gene is fantastic to deal with. You can tell in his voice how much he loves Vail and wants everybody else to as well. Both units are similar. 303 has 4 queen size bunks and a twin standalone upstairs. 301 has 4 twin bunks and a queen standalone. Of course they both have the master downstairs. We had 7 in one unit and 6 in the other. 301 is a corner unit and has a slightly better view. But I wouldn't really choose one over the other because of the view. We thought we would sit on the balcony at times but never did. We would just go outside and sit in the many options right out the door. Both units have washers and dryers which we definitely used and appreciated. To me the units felt larger than they were. We usually had breakfast and often prepared dinner between the two units and had plenty of room to do so. I've been to Vail many times and this is my favorite place yet. Thanks Gene! Great place to stay for ski trip! Family of four stayed for a week of skiing. Great location close to Gondola 1. Located in Vail Village on 3rd floor of Wall St. building. Condo is well appointed with everything we needed for stay. One bed downstairs in master, and 5 beds upstairs in loft. 2 comfortable bathrooms, one on each level. You will have to park a 0.4 miles away in the Manor Vail parking garage, as parking is limited in Village. Once we parked, we never used car anyway, as shuttle service is nearby. Gene is great to work with and answers questions promptly. Thanks for a great stay. Easy walk to everything in Vail village, just steps to the gondola, restaraunts super close, accomodations exactly as we hoped, thanks we will return again, multiple time! Fantastic early season snow too! Vail, Colorado is a vacation world unto itself with a landscape all its own, from its geography to its culture, personality, and demographics. It is a center for outdoor recreation, nightlife, skiing, shopping, arts and culture, style, and some of the best food and wine in the country.